Somalian cave fish (Phreatichthys andruzzii) evolved in the perpetual darkness of caves more than a million years ago. Even so, they have a working, albeit distorted, biological clock. A blind cave fish that has spent millions of years underground isolated from evidence of day and night still has a working biological clock, albeit an unusually distorted one, scientists find. This research could yield new clues on how such clocks might work in animals in general, researchers added. Internal clocks known as circadian rhythms help animals, plants and other life to adapt their daily activities to the cycle of day and night. These clocks do not always follow a precise 24-hour schedule, so to keep synchronized with the natural world, they get reset on a daily basis by signals such as daylight. One question circadian clocks bring to mind is whether and how those creatures that live in perpetual darkness still keep time. For instance, about 50 fish species worldwide have evolved to live without sunlight in caves, many times losing their eyes. "Cave fish give us a unique opportunity to understand how profoundly sunlight has influenced our evolution," said researcher Cristiano Bertolucci, a chronobiologist at the University of Ferrara in Italy. 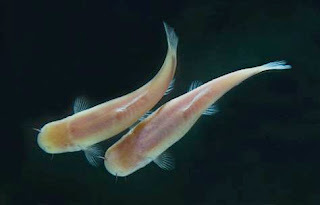 Bertolucci and his colleagues investigated a Somalian cave fish (Phreatichthys andruzzii), which has lived isolated for 1.4 million to 2.6 million years beneath the desert. They compared swimming behavior and clock-gene activity seen in a relatively normal fish, the zebra fish (Danio rerio), with that seen in the cavefish. Zebra fish had circadian clocks that were very rhythmic, synchronizing with cycles of darkness and light. Unsurprisingly, the blind cave fish's behavior did not similarly keep in sync with the light. However, when a different rhythmic signal was used — a regular time at which the fish were given food— the circadian clocks of both zebra fish and cave fish matched it. This revealed that cave fish clocks could work if given a relevant signal such as food. A closer look at the clock genes of the subterranean fish revealed mutations in two major light-sensitive chemicals known as opsins that rendered them unable to respond to light and thus kick-start circadian rhythms. Oddly, when the cave fish were given a chemical known to activate clock genes in normal fish, the blind fish's circadian rhythms moved at a bizarrely long cycle of up to about 47 hours long. The fact that cave fish clocks no longer follow a 24-hour cycle suggests "maybe these animals are in the process of losing their clocks," researcher Nicholas Foulkes, a chronobiologist at the Karlsruhe Institute of Technology in Eggenstein, Germany, told LiveScience. These complex mechanisms appear hard to alter, however, given how they often seem largely unchanged across many different species, "and therefore it might take a lot of time to actually lose them. As part of this ongoing process, this could be why this clock is broken, running at 47 hours long instead of 24 hours long. Maybe in a million years, this fish might not have a clock at all," Foulkes added. It remains uncertain whether the clock still serves them any purpose whatsoever. Much is poorly understood when it comes to how light regulates circadian rhythms. Analyzing how these clock genes work in blind cave fish has thus provided "the first clues" in solving the mystery as to what light-sensitive molecules are key in other fish, Foulkes said. "This study sets the stage for a more complete understanding of how clocks respond to their environment," Foulkes added. Mejia R (2011) Cave-Dwelling Fish Provide Clues to the Circadian Cycle.